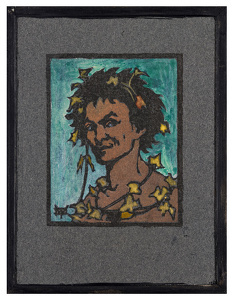 This hand-coloured woodcut of Bacchus was conceived at the same time as Marion Wallace-Dunlop’s roaring and grinning Devils in Divers Shapes emerged from an imagination that conceived daring and innovative protests for the women’s suffrage movement, including the first hungerstrike campaign. 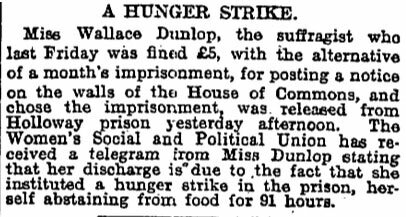 In July of 1909, Wallace-Dunlop staged a hunger strike and followed up with newspaper interviews. Previously, she led other protests, including women’s deputations to Parliament and stamping messages in violet ink on the walls of Westminster (she is memorialised in the stained glass in St. Stephen’s Porch), and, later, massive street processions – each conceived to capture headlines and stir emotions. 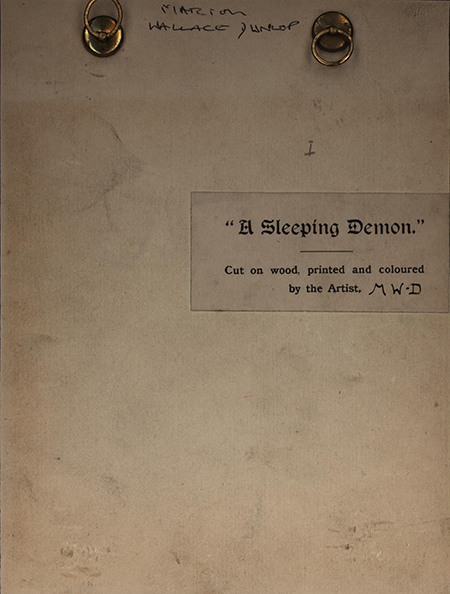 Her rare 1905 prints similarly evoke outrage, humour and impishness. 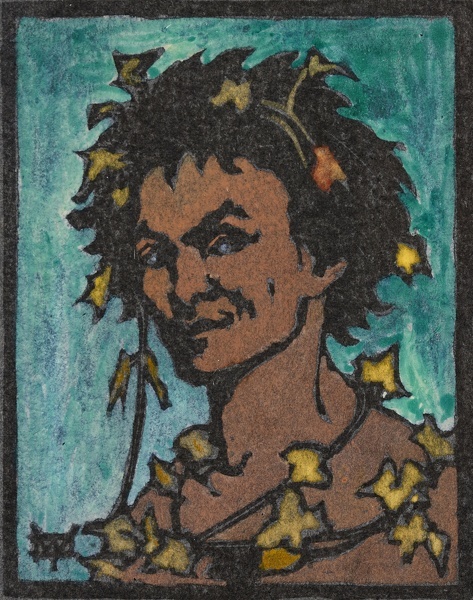 A devotee of faery lore, the Celtic twilight and fine art, Wallace-Dunlop grew up near Inverness and descended from the rebel family of William of Wallace. Trained in fine art, Wallace-Dunlop set up her studio in 1890s London, out of which she painted portraits and watercolours, illustrated children’s books and published cartoons in Punch and elsewhere. After 1906, however, she turned her classical training in painting and printmaking to the service of the militant women’s suffrage movement. Along with the Pankhursts in the Women’s Social and Political Union, she directed the creation of tapestries, banners and prints. 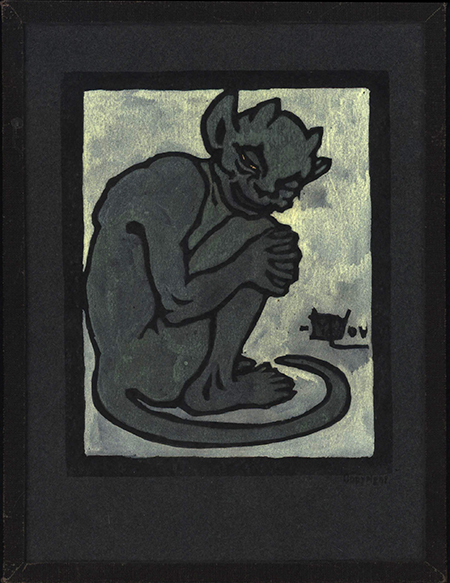 These diminutive devils fascinate because they seem to embody full emotions – from deep outrage to mild distemper, wild surprise to joyful and proud self-regard – with a measure of innocence. These “divers”, androgynous, and sometimes amphibious creatures are never bashful and are in full command of their moments. Their emotionality distinguishes them from the urbane and decadent illustrations of her contemporaries William Strang and Aubrey Beardsley. Like them, Wallace-Dunlop’s imagination did not peddle morality over passion, but unlike their works, Devils in Divers Shapes unapologetically revels in both soulful silliness and emotive energy. Commentary by Joseph Lennon, Associate Dean, Emily C. Riley Director of Irish Studies and Professor of English at Villanova University. He has written two books – Irish Orientalism: A Literary and Intellectual History (2008) and Fell Hunger (2011). His current project focuses on the origins of the modern hunger strike.